From 15th to 18th December next, the elegant Taipei exhibition hall will be hosting the first Taiwan International Boat & Watersports Show. Organised by the company Formula Ten - headed by English manager Julian Jesson - on behalf of the Taiwan External Trade Development Council, and sponsored by, among others, our magazine Superyacht, the show will see the participation of about 70 exhibitors. International press coverage is guaranteed: CNN itself will be doing a special of no less than forty minutes. As for estimated visitors, there is talk of around 150.000, chiefly concentrated over the weekend. The island the Portuguese called Formosa - beautiful - moves with a catlike tread, without too much noise. So you are surprised when, looking at the figures, you discover that its yachts are already widespread, perhaps with European or American sounding brand names. And now it's the superyachts' turn. The Taipei boat show is about to present them to the whole world. Notwithstanding the ill-concealed appetites of the great powers nearby, Taiwan - with roughly 23 million inhabitants on an area about one and a half times that of Sardinia - continues to maintain a considerable social pace and rise up the ladder of the most industrialised Asian countries. It is no accident that one of the factors guaranteeing stability in a political situation of vague outlines is that Taiwan is the biggest "external" investor in China and that its constant surplus trade balance has led to its possessing one of the greatest reserves of foreign currency in the world. This growing wealth is made tangible in the typical manifestations of what is called state well being: public works, schools, universities, parks, great restorations etcetera. But a considerable part - less spectacular if you like - is ploughed back into industry in the form of technological investment, personnel training, importation of know-how. The result is that over the last twenty years "Made in Taiwan" has progressively succeeded in distinguishing itself from all the other Asian "made ins", earning an image of high quality while others preferred only to play the card of low prices. The shipbuilding sector is, together with electronic hardware, certainly one that has gained greatest advantage from this policy. To give an idea of its prodigious evolutionary process we need only think that in the early 60's the building of yachts was so unconsidered as not to come under activities worthy of "measurement" in accordance with the classic economic indicators. In 1971 the records showed 28 vessels. Towards the end of the 80's there were already 1.600 a year. 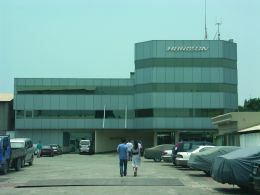 Fundamental to the incorporation of an equally significant qualitative growth into this business escalation was the work of the United Ship Design & Development Center (USDDC), established in 1976 under the auspices of the Ministries of Economic Affairs, National Defence, Communications and Defence. This non profit making body still consists today of a rich staff of engineers, architects and technicians with all specialities whose task is to assist shipyards in every necessity - organisational, technical or design-related - by providing research laboratories and benches for tests of all kinds. There is even an educational area dedicated to training engineers who aim to take on specific tasks within their respective shipyards. Thanks to this massive collective commitment, the most important shipyards - substantially about thirty companies that are already exporting around two thirds of their production to the USA and the rest worldwide - are experiencing an epoch-making turning point: meaning that in the space of maybe five years the average length of vessels will increase considerably, bringing Made in Taiwan products into fair competition with the more celebrated German, Dutch and Italian yards on the rich superyacht market.. The coordinator of this effort is the Taiwan Yacht Industry Association, headed by Jack N. Chen who founded the shipyard Bluewater Yacht Builders. Needless to say, his own company - well known also in Europe for its Vagabond sailboats which had considerable success in the 70's - is one of the most involved in this process, being already capable of producing completely personalised boats up to 110 feet. However, the most emblematic sign of this turning point is the debut of the Jade Yachts trademark from the great Jong Shyn shipyard, specialised for decades in the production of merchant and military vessels in steel and light alloy. The specific debutante is actually a complex and painstaking work of reconstruction, restoration and transformation of a 1968 German oceanographic ship - the 67.6 metre One Eagle - into a luxury yacht for an owner who could not find a single European yard willing to accept the job, in spite of its extreme interest both economically and in terms of image. But other companies are already capable of building pleasure ships. Let's look at a few examples. Horizon - the biggest Taiwan yard in terms of vessel length - already holds the world record for the longest fibreglass hull produced to date with the infusion method; and within five years, when the new premises for steel is fully running, it will be able to build superyachts up to 70 metres. As for European design and taste, a guarantee is offered by names of acknowledged international standing, as in the case of Tommaso Spadolini who is one of company chairman John Lu's favourite designers. Ocean Alexander, a shipyard set up about thirty years ago by Alex Chueh and today run by his son John, has no less than five models between 74 and 98 feet in its catalogue, all designed in perfect American style by Ed Monk Jr.
Kha Shing Enterprise builds twenty boats a year, of lengths up to 110' and almost all destined for the United States market. However it will shortly be activating a new European sales network, aimed particularly at the Mediterranean for which it already has the elegant Monte Fino series. As the name suggests, it is characterised by a typically Italian style. Taiwan's oldest shipyard, Tachou, was founded in 1925 by T.C. Chen. It has a range of American type vessels which extends to the new Olympia 77: a motoryacht which in the most powerful version - two 1500 HP MTU with hydrojet foot - can touch a maximum speed of 40 knots. Tachou can build four of these a year, which is no small matter if we consider that they are rigorously customised boats. The yard's main market is Japan, but a spreading towards Europe is envisaged. 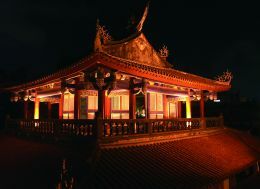 Ta-Shing is situated in Tainan, which is to say the most traditional shipbuilding zone. 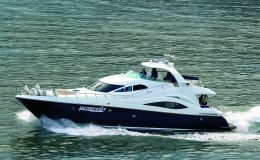 It has an extensive and varied range of motoryachts and sailboats. The cutting edge however is the series of Nordhavn trawlers, available in 68' 72'and 76' models, about 15 of which are built every year. This yard's biggest problem - declared with ill- concealed pride - concerns production time schedules: far too slow in comparison with their direct competitors, since the philosophy of the custom-made is applied here in an almost furious manner. Johnson produces 7-9 vessels a year, up to 87 feet in length, built to Bill Dixon's designs adapted to the owner's needs. 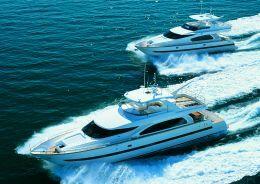 The 70 footer (more than 60 vessels built) and the 87 footer (more than 40) are among the yard's most successful models. 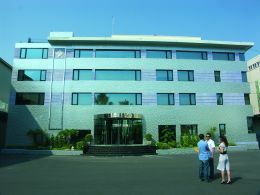 At the beginning of 2006, more or less, when the new premises are added to the existing ones, work will begin on a 103 footer. 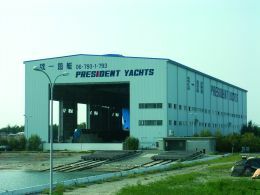 President is certainly one of the island's most marketing oriented shipyards. The new complex developed around the central body of the yard (a shed measuring 125x35xh25 metres) actually includes a 40 room hotel, strictly reserved for customers. It also has special accommodation with tatami and mobile walls for Japanese owners. The current range of motoryachts extends to 70 footers, but when the new premises are added the yard will be able to build vessels up to 150 feet. Cruise Line, active since 1986, builds less than 10 boats a year - all rigorously customised - in a range between 46 and 88 feet. It is one of the few yards specialising in the American type Fisherman. 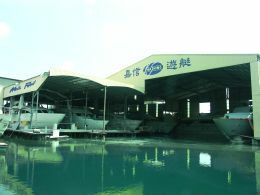 Ta Yang Yacht Building, better known as Tayana, is one of the few yards specialised in sailboats. Its founder and current chairman, Peter Chen, is no lover of computers (which he willingly leaves to the technical studio designers) and prefers to draw everything by hand, in which he is a master. To give an idea of the quality expressed by this company we must - without any reverential fear - bring in names like Oyster, Contest or Hallber-Rassy.